Thanks to a generous grant made possible by The Jefferson Trust, an initiative of the UVA Alumni Association, and in partnership with UVA Special Collections, Rare Book School now invites students at the University of Virginia to apply for a new fellowship program designed to share the history, craft, and technology of historical printing presses with the University community and broader publics. 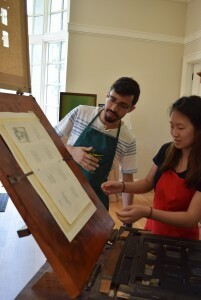 Receiving specialized training and instruction to print with unique historical printing presses, Presswork Fellows take on a teaching role themselves, helping to lead printing demonstrations for UVA classes and the general public as teaching assistants. No prior printing experience is required. The program offers UVA students not only insight into historical technological process, but also an opportunity to help design and conduct public-facing projects on Grounds. See the Presswork program page for more information about all Presswork activities. Presswork Fellows attend a five-day course at RBS for free (tuition is currently $1,395 or $1,495, depending on the course) and receive a $500 stipend. In addition, Presswork Fellows who help teach printing sessions will be paid honoraria for their work. Applications for Presswork Fellowships will be accepted on a rolling basis through the spring of 2019. A limited number of fellowships are available, so we encourage interested students to apply sooner than later. an application coversheet (PDF). Use Adobe Reader to fill out and sign this form. (The Mac Preview application will not fill out this form correctly.) Once you have the form saved to your desktop and open with Adobe Reader, click “Sign” to fill out the form. Click on “Place Signature” to sign the document, and then click “Done Signing” to finalize the document. Finally, click on the “Send Signed Document” button to submit the form to us. Applicants must be undergraduate or graduate students currently enrolled and in good standing at the University of Virginia, and must be able to fulfill the obligations outlined above (see “Presswork Program Activities”).